Before the chaos of the holidays hits us, we like to take this month to remember that spending quality time together isn’t always about being entertained. We grow close as families when we serve others together. Giving back doesn’t have to been a huge event; every heartfelt action makes a difference. We know first-hand how difficult it can be to figure out how to volunteer when you’re factoring in small children. We’ve come up with some simple suggestions all ages can take part in to find the family fun in giving. Ring Bells at Salvation Army’s Red Kettles – If possible, take an hour out of your day with your kids and go ring some bells to raise money for those in need. People love seeing kids participate–there is something extremely heart-warming when a child cheers for their donation. Donate gently used coats to a coat drive – Life in Minnesota can be frigid. If you have coats your kids have grown out that are still in good condition, donate them. The Salvation Army can help you find new homes for them. Bring children with to a food shelf to donate – This summer, we went to our local food shelf to donate extra produce from our garden. In November, KARE 11 will host their Annual Food Fight. Bring your kids to your favorite anchor’s location, donate, and help them win! Collect loose change together and donate it – Bring your loose coins into a local TCF Bank. Use the coin machine and when the counter has produced a receipt, give it to the teller with the name of a charity partner you want to support. Make a meal for a family in need – Contact your local church or Salvation Army. They will give you the necessary information you need if you tell them you would like to feed those who are hungry. Starting a Meal Train for a family that could use some extra help is also a great option and you can get the kids involved in preparing the food. Clean up your kids’ favorite park – grab work gloves, plastic bags and a few friends. Head to your nearest park and spruce it up a little. Visit a nursing home – the elderly or ill should not be overlooked. They have so much to offer in enlightening your perspective. Support businesses that donate to organizations – this holiday season, bring the kids to shop for Christmas presents at stores that donate to charities. 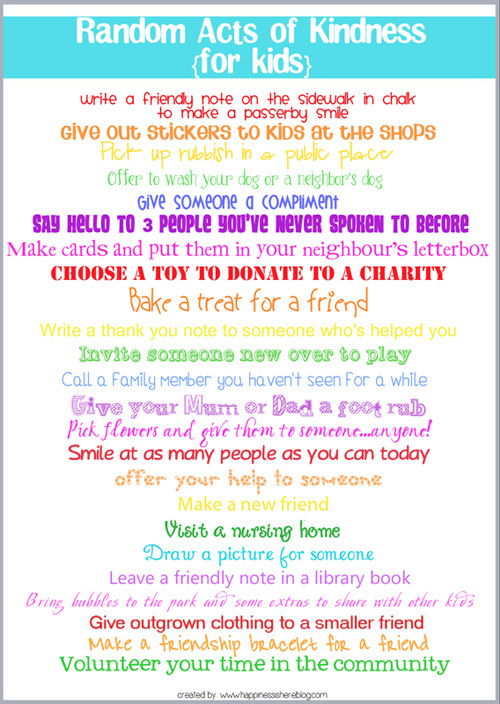 This colorful Random Acts of Kindness for Kids printout was created by Sara from Happiness is Here. You could use it now or save it for December as a holiday countdown! Doing Good Together has some awesome ideas for us as well that don’t include going anywhere. These work for any family, any budget and any time frame you have. Volunteer Match connects you with volunteer opportunities based on your interests. Follow the example of one little 6 year old who wanted to make a difference for each person she meets. Evie is going to change the world!